Big distinction: This incident occurred in 2010, when Franken was already a senator, notes Ed Kilgore at New York. That means the Senate ethics panel has direct jurisdiction over this one, unlike the earlier incident, which occurred during Franken's pre-Senate days. "It also quite obviously makes the Tweeden incident look like part of a pattern rather than an isolated mistake." More serious: At the Washington Post, Amber Phillips writes that it seemed plausible Franken would weather the first storm, because he could pass off the lurid photo as a tasteless joke. But now she's not so sure. The new incident raises the question: Is Franken "a serial groper?" 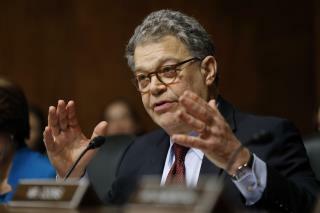 Franken himself has previously said accusers should get the benefit of the doubt. "If we are to take Franken at his word then, (Lindsay) Menz's allegations become a lot more credible." Resignation call: The calls for the end of Franken's Senate career aren't coming only from the right. CREDO Mobile, described by Politico as a "cell phone company that maintains a liberal activism arm," called for Franken's resignation Monday. It wants Minnesota's Democratic governor to replace him with a progressive woman. Not yet? Rich Lowry of the National Review finds the latest accusation credible and bad news indeed for Franken, but perhaps survivable. "This pushes Franken closer to the brink, although I’m guessing it will take something else—and perhaps something more lurid—to push him over the edge." Does he get a pension and free medical the rest perverted days. when he fired for sexual assaults, i hope not. FRANKEN NEEDS T0 RESIGN. THERE'S N0 QUESTI0N WITH THIS GUY... THEY HAVE THE PICTURES. What an odious toad Franken is. If he had any integrity, he'd resign.